Egypt's Isis and Osiris is showing in Vietnam for the first time as part of the celebration of the 55th anniversary of the diplomatic relations between Egypt and Vietnam. The show is produced by the Cairo Puppet Theatre Company, part of the Artistic House of Theatre, was performed at the Water Puppet Theatre in Hanoi, Vietnam, on Thursday 7 March. It is the first time for the show to be presented outside Egypt, and the audience included the Egyptian Ambassador to Vietnam Mahmoud Nayel, as well as the ambassadors of Tunisia, Morocco, Oman and Chile, together with a number of senior officials from the Ministry of Foreign Affairs, Tourism, Youth and Sports, and many representatives of the Egyptian community in Vietnam. The Egyptian delegation led by stage director Khaled Galal, the head of the Cultural Production Sector, comprised Director of the Cairo Puppet Theatre Company Mohamed Nour and Director of Festivals and Cultural Events Department at the Ministry of Culture’s sector of foreign cultural relations Hayat Ahmed. According to the director of the show and the supervisor of the Water Puppets Project in Egypt Maye Mohab, the show dazzled the audience with its use of an authentic Vietnamese art. 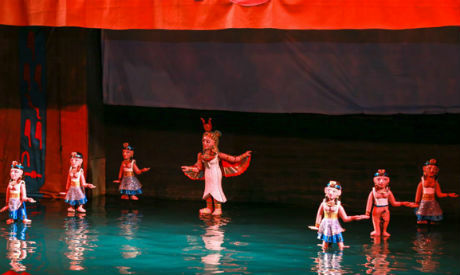 It was the first time a water puppet show from another country was presented in Vietnam.” Using water instead of wood as a surface for shadows, this form of theatre exists indigenously only in Vietnam but has been adopted by Egypt.